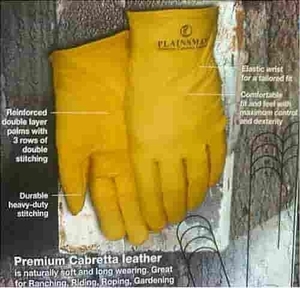 Plainsman Leather Gloves, two pair of tough, durable and pliable Plainsman gloves are perfect for all-purpose work and outdoor adventures, such as, ranching, roping, hunting, gardening, farming, construction, driving and more. 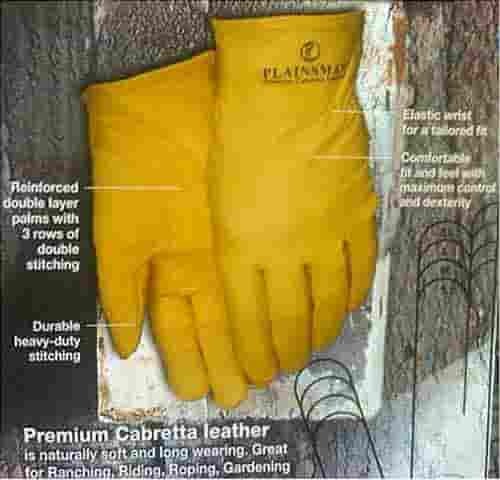 Plainsman glove use only the finest, top grade Cabretta goatskins and are tailored into the most comfortable, strongest and durable protection for hands. These thin soft and supple gloves allow great sense of touch, maximum mobility, fine control, comfort and dexterity. Tripple stitched, double-layer reinforced palms with no seams between fingers, are designed to endure rough and repeate uses. Shirred elastic back and open cuff features for your ease and comfort, no matter what the job the Cabretta goatskins leather gloves will give your hands the right protection. Features: Tailored, elastic wrist and Reinforced palms Premium cabretta leather double stitching.